The total area of the state was 8176 square miles and its territories were composed of four scattered and non-contiguous divisions, of which three were each intermixed with surrounding territories of the British and Indian States. The fourth was in the Kathiawar peninsula. Kadi Division was situated in northern Gujarat with an area of 3,105 square miles. Bounded on north by Palanpur and Radhanpur, on the west by Mahi Kantha District, Radhanpur and the Ahmedabad district; on the south by Ahmedabad and Kaira districts and on the east by the state of Idar, Mahi Kantha Agency and the Ahmedabad district. Kadi division was later on known as Mehsana Division. This division was composed of Patan, Sidhpur, Kheralu, Chanasma, Visnagar, Mehsana, Vijapur, Kadi, Kalol, Dehgam, Harij and Antarsuba talukas. Baroda Division was surrounded by Kaira district in north, on the west by Broach and part of Kaira district and Cambay, on the south by Broach district, Narmada River and the state of Rajpipla and on the east by Rewa Kantha Agency and the Panch Mahals. It had an area of 1,887 square miles. 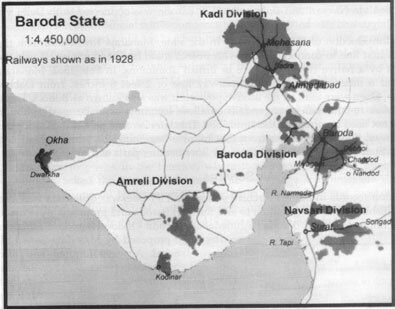 Petlad, Savli, Waghodia, Vadodara, Padra, Dabhoi, Sankheda, Sinor, Chandod, Karjan, Bhadran and Tilakwada talukas were parts of the division. Navsari Division was bounded on the north by Broach district and the state of Rajpipla, on the south by Bansda, the Dangs and Surat district, on the east by Khandesh district and on the west by Surat district. This division was composed of Mangrol, Kamrej, Songadh, Vyara, Mahuva, Palsana, Navsari and Gandevi talukas and had an area of 1,952 square miles. Amreli Division was in Kathiawar and consisted of 17 separate portions lying generally in and around Junagadh, Jetpur and Nawanagar States. Okhamandal, Talukas of Amreli, Dhari, Khambha, Kodinar, Damnagar, Bhimkatta and Shianagar were the part of this division. Total area of the division was 1,245 square miles. In May 1920, Okhamandal subdivision was separated out from Amreli Division and became an administrative subdivision directly under the state.